Reader Reviews of C.B. 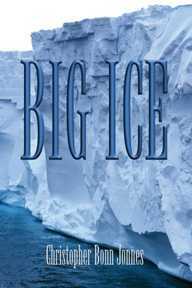 Jonnes' second book, BIG ICE, a global warming suspense novel. Click here for 218 reviews of the first C.B. Jonnes book, WAKE UP DEAD. "Jonnes has hit another home run. He keeps the action moving and the reader guessing until the final page. Fascinating characters; nonstop action; cutting-edge science--BIG ICE has it all. Not your ordinary sleuth ... BIG ICE take you inside the mind of a fascinating character: a sleuth you really find yourself rooting for. I hope we'll see more of Seth Peterson. BIG ICE is that rare thriller that really develops its characters." -- Brian Lutterman, Author of "Poised to Kill." "You'll be cheering for the main character, and I promise, he will not fail you when the time comes. Get it! And enjoy it!" -- FIVE STARS from M.D. Cummings, author of "Whipped Pups of Bitterbrush"
"Christopher Bonn Jonnes, author of Wake Up Dead, is back with a second, more harrowing novel, Big Ice. This well-researched thriller is thick with tension and suspense. Jonnes manages to start the book with action, end it with action, and fill all of the chapters between with action. This is a smart, hard-hitting thriller. But I expect no less from Jonnes, who blew me away with his first novel, Wake Up Dead. His facts are intriguing; to think that a natural disaster, worse than any earthquake is out there waiting to happen is frightening. Jonnes is skilled at incorporating dialogue, taut chapters and three-dimensional characters to strengthen and solidify this already impressive and unique story line. Big Ice is easy to get into and hard to put down and will be impossible to forget." -- FIVE STARS from Phillip Tomasso III, author of five novels. "Electrifying Suspense. Almost any story set in the nation's capital personally intrigues me. Such a setting usually promises unanticipated twists and high-energy excitement. BIG ICE therefore immediately hit the spot for me. I was drawn especially to the protagonist Seth because of the manner in which the author Christopher Bonn Jonnes artfully tackles the delicate inner psychological nature of this complicated character. This aspect fascinated me far moreso than the surface storyline, which was totally suspenseful. I'm sure most readers were able to identify quite readily with Seth. The author offers us a splendid work of nervous suspense and mystery. I definitely intend reading Jonnes's previously successful WAKE UP DEAD. A Very Highly Recommended Read." -- FIVE STARS from Alan Cambeira, author of AZUCAR! The Story of Sugar. "The book is a real page turner, with enough plot twists and turns that you have to keep reading. Seth is not your typical hero. He doesn't have a perfect life. He is just an ordinary guy with problems that he has to overcome. In my mind that just makes him all the more endearing and easy to relate to. Seth's phobia is handled very well, very realistically (I suffered from this same phobia and the author has got it exactly right.) An exciting tale that doesn't let up. A great read." -- FIVE STARS from TwistedTales.com by Annette Gisby, author of Drowning Rapunzel and Shadows of the Rose.